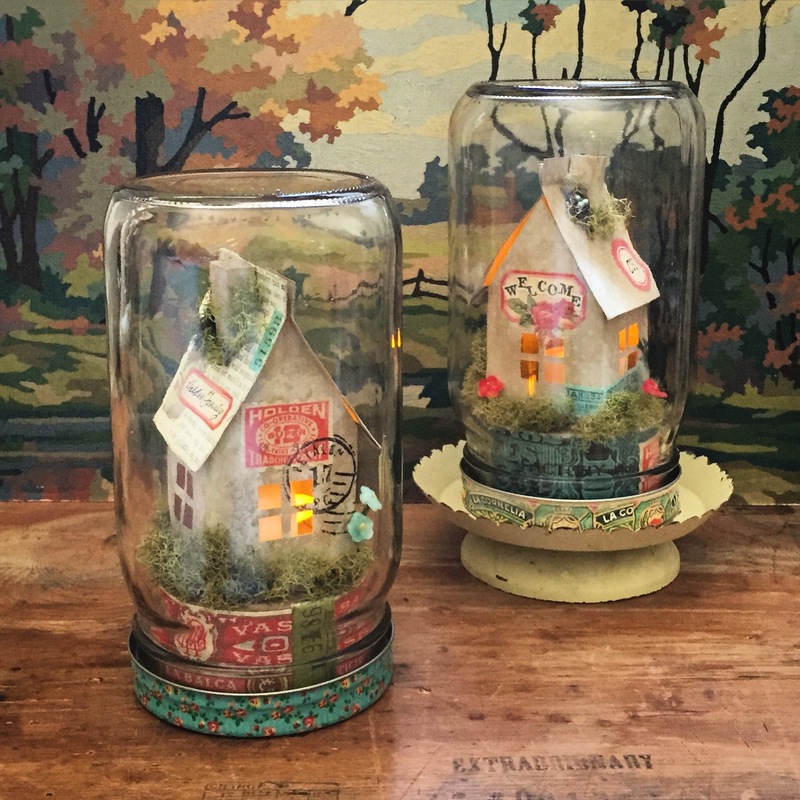 I taught three separate workshops in July and August here at Inspired Barn where we crafted adorable illuminated displays utilizing mason jars, papercrafting, collage, and assemblage. 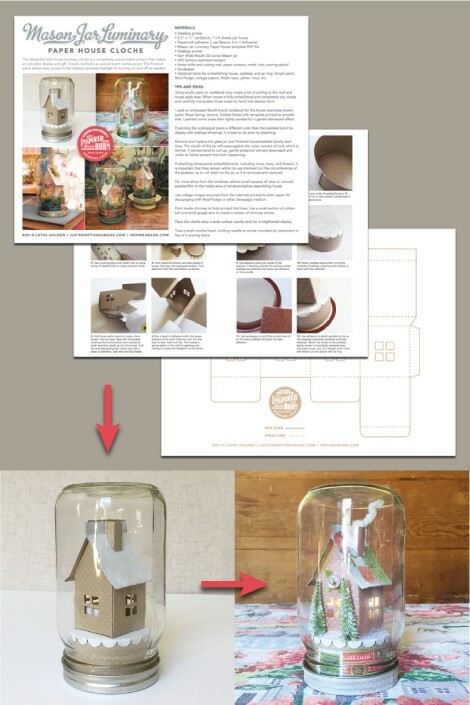 Since most of you are not in my area and are unable to attend such a workshop, I went to work creating a digital kit for you so you can craft this project wherever you are! 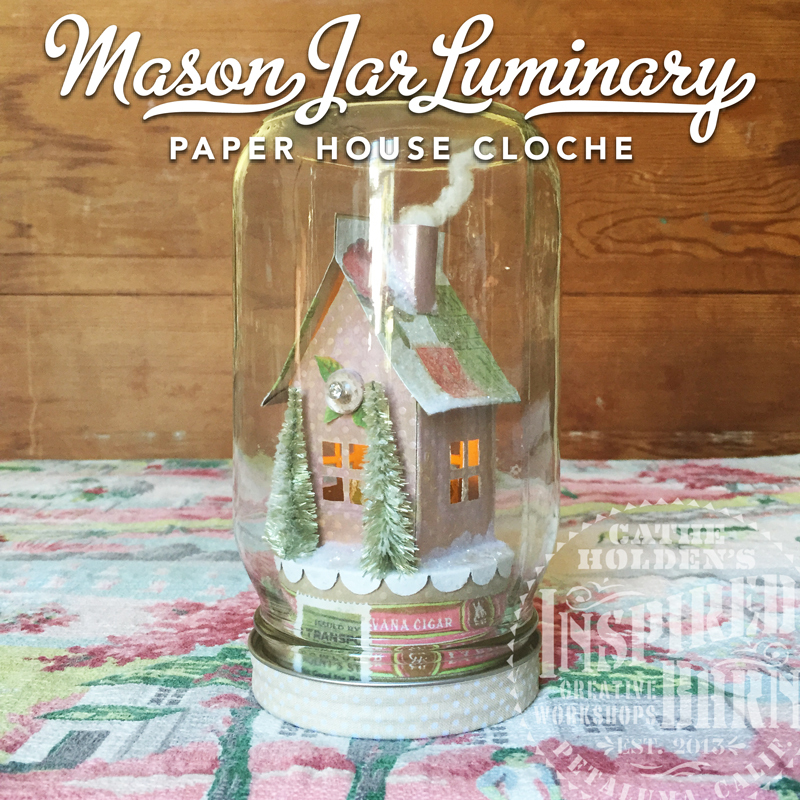 You can find this kit for sale right now in my Etsy shop, along with two other paper house projects. 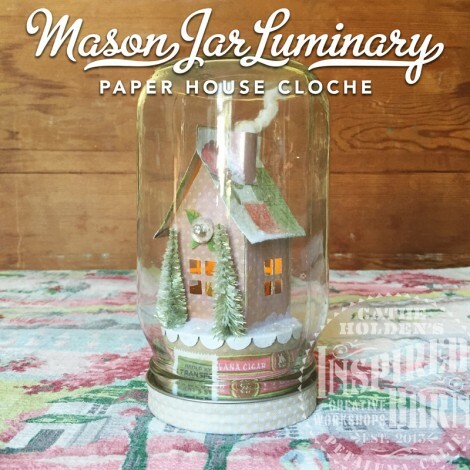 This kit includes step-by-step photo instructions, and a template (to print to cardstock) for crafting a house and pedestal sized perfectly to fit a Kerr brand wide-mouth mason jar (available at Michaels) and one battery-operated LED tealight per luminary. I’ve included a full materials list along with a load of tips and ideas for embellishing and customizing your cloche display. Below are some of Inspired Barn attendee’s finished projects utilizing supplies provided in class and a few they brought with them. Pull out your embellishments, order the kit, and be inspired to craft your very own (everyday or holiday) version for yourself, as gifts, or special event centerpiece such as wedding or bridal shower decor. This entry was posted in assemblage, Christmas, classes, collage, Decorating, Etsy, Inspired Barn, Paper Crafts, party favors, Wedding. Bookmark the permalink. Your projects are just beautifully done. Very cute too! Thank you for sharing and keep up the great projects. This class was so much fun! We drove hours to attend and it was absolutely worth it! Thanks, Cathe, for attending to every little detail. 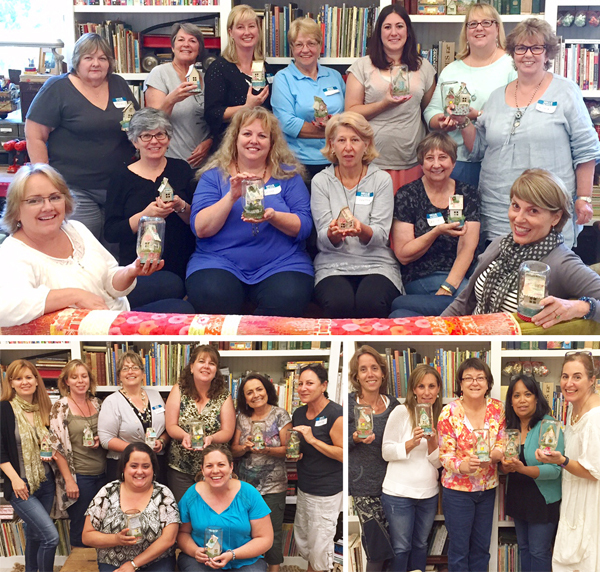 I was most pleased to discover your jar luminaries. I appreciate the spelling of your name. It is so important to be an individual!!! What a wonderful idea! I am a miniaturist, and those little houses really appeal to me — a creative display? Cathe please let me know when your having another class. My friend Brenda Walton told me how fun your last class was.